In this charcoal drawing video lesson various charcoal techniques are throughly demonstrated. 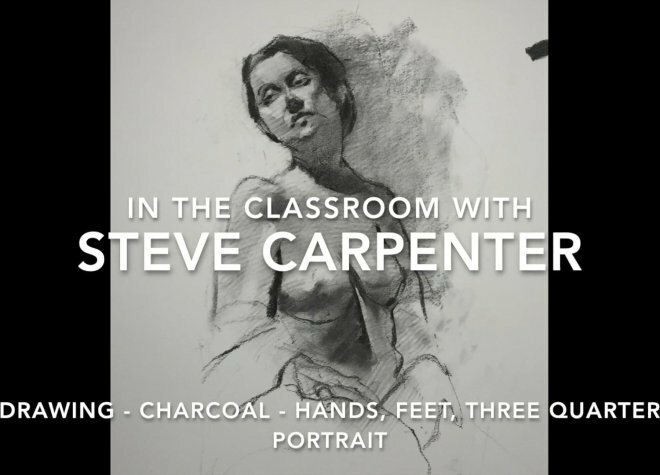 In the first portion of this video Steve demonstrates a basic approach for rendering hands and feet in charcoal drawing. The second portion is a demonstration of waist up portraiture. Many charcoal drawing concepts are explained such as line, value, form, scale, measurement, foreshortening. The basics of charcoal portraiture are covered. Tips, shortcuts and charcoal techniques for rendering facial features, tips creating form through the use of dark, middle tones, and highlights, and finishing techniques.